The Sharp Compet 241 takes the utilization of MOS circuitry to the "next level", after the previous generation of machines such as the Sharp Compet 22. The 241 makes use of somewhat higher-levels of integration to further reduce the component count from the earlier calculators. The Compet 241 has virtually the same functionally as the earlier Sharp Compet 22, although the Compet 241 is almost a third larger than the Compet 22. This seems somewhat contrary given that the 241 was introduced nearly two years after the Compet 22. Why a larger-sized machine in an age where the machines were getting dramatically smaller? It could be that Sharp's marketing department felt that the "larger desktop" footprint had a feeling of quality, or "presence" in the desktop office environment that perhaps some segments of the market, having grown accustomed to full-size desktop calculators, needed in order to feel comfortable. 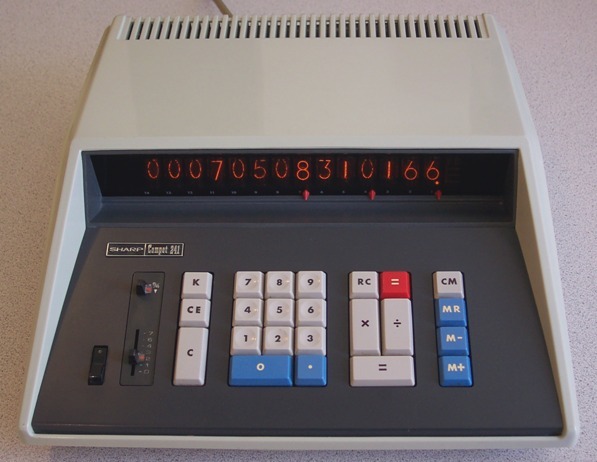 Whatever the reason, the Compet 241 (and it's 16-digit stablemate, the the Compet 261) were high-quality, successful desktop calculators when introduced into the marketplace in 1970. Sharp marketed the Compet 241 as the "MIDI" calculator in their line advertising in the late summer of 1970. The Compet 241 follows every standard of Sharp calculator implementation of the time. It's a 14-digit, Nixie tube-display, four-function machine, with fixed decimal mode, and an accumulator-style memory register. The machine was likely popular in accounting, banking, and other applications where its 14-digit capacity came in handy for dealing with larger numbers. Like earlier Sharp calculators, the 241 has indicators in the [X] and [÷] keys that light up to indicate a pending multiply or divide operation. The machine provides a constant function (enabled by a push-on/push-off [K] key), which operates (unusually) in all four functions. The machine operates in fixed decimal mode, with settings of zero through seven digits behind the decimal selectable by a slide switch rather than the rotary knob of earlier machines. The machine will allow entry of numbers with up to seven digits behind the decimal point without regard to the setting of the decimal point slide switch, but will ignore any subsequent digit entries. Once a number is entered (by pressing an operation key), the number is corrected to contain the selected number of digits behind the decimal. The machine does not provide leading or trailing zero suppression, nor does it feature automatic digit grouping. A set of three manual sliders allow the user to position marks to group digits to assist in readout of larger numbers. Above the decimal point selection slide switch is a two-position slide switch which selects truncation or rounding modes for the last significant digit. If set at the "5/4" position, the calculator will round up or down the least signficiant digit behind the decimal point specificed by the decimal point setting. If set at the "▼" setting, the machine will instead truncate the result to the number of digits behind the decimal as specified by the decimal point selection slide switch. The Compet 241 is operated in the same manner as its earlier predecessors Like many calculators of the era, the 241 does not provide correct answers with a full 14-digit dividend. This is because one of the digits of the working register is used as a counter during division, thus limiting dividends to no more then 13 digits. Overflow is detected, and indicated by "E" lit in a special tube at the right-end of the display. Upon overflow, the keyboard is logically locked so no further entries or operations can be performed, until the [C] (Clear) key is pressed to reset the machine. Division by zero results in an immediate overflow condition, however, the result left in the display is indeterminate. The machine uses a custom gas-discharge tube at the right end of the display bank that lights a minus sign if the number in the display is negative, displays an "E" in error or overflow conditions, and also indicates if a non-zero content is contained in the memory register by displaying a small "I". The keyboard of the Compet 241 is virtually identical to that of the Compet 22, down to the same mechanical hardware and keyboard design. Like the earlier machines, the keyboard uses magnetically activated reed switches for reliability and long-life. The keycap colors, layout and function are identical to that used on the Compet 22. The left-most group of keys contains the push-on/push-off constant [K] key; the [CE] (Clear Entry), and [C] (Clear) keys. The [CE] key clears the content of the entry register, allowing entry errors to be corrected. The [C] key clears the working registers of the calculator except for the memory register, and clears any error condition. The next grouping of keys is the traditional numeric keypad, with a double-width zero key. The numeric entry keys feature a mechanical interlock that prevents the depression of more than one key at a time. The math function keys make up the next group, with lighted [X] and [÷] function keys. These keys have a molded-in red-colored jewel nomenclature, with incandescent lamps mounted beneath the key that light when a multiply or divide operation is pending. The white [=] key serves as the addition function key, and also triggers the machine to calculate the result of multiplication and division operations. The red [=] key is used for subtraction or for negating the result of multiplication and division operations. The [RC] key swaps the content of the entry and operand registers. The right-most group of keys controls the operation of the memory register. The [CM] key sets the memory register to 0, extinguishing the "I" indicator on the display panel. The [MR] key recalls the content of the memory register into the display. The [M-] and [M+] keys subtract or add the current content of the display to the memory accumulator register. If the memory add or subtract operation results in an overflow, the "E" indicator is lit and the keyboard is logically locked, but it appears that the machine goes ahead and carries out the operation, resulting in a rollover of the memory register. For example, performing 99999999999999, [M+], 2, [M+] will result in the "E" indication coming on, and the keyboard being locked. Pressing the [C] (Clear) key resets the error condition, but as mentioned earlier, does not clear the memory register. Then pressing the [MR] key at this point will recall a result of 00000000000002. Electronically, the machine is part of Sharp's second-generation of desktop calculators utilizing MOS (Metal-Oxide Semiconductor) integrated circuit technology. The IC's are predominantly manufactured by NEC, with a few Hitachi-made parts sprinkled about. Two of the Hitachi parts are from Hitachi's HD-31xx series of IC's, Hitachi's first series of PMOS IC's developed specifically for use in calculator applications. The remaining few Hitachi parts are from the earlier HD-7xx series. The majority of the 53 integrated circuits in the machine are from NEC's second-generation uPD-1xx series of small and medium-scale MOS IC's. All of the NEC integrated circuits are in plastic dual-inline packages, while the Hitachi HD-31xx series parts are in ceramic dual-inline packages, and the HD7xx-series chips are in can-type packages. Date codes on the IC's and other components indicate that the machine was manufactured sometime in the early part of 1971. A date code stamped on the upper part of the cabinet indicates a manufacture date of 12/12/1970. 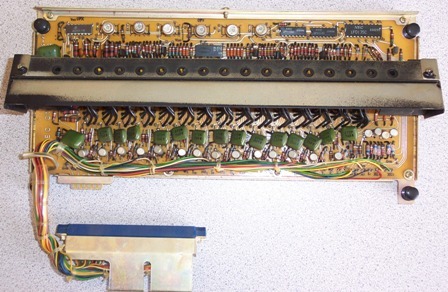 The calculator logic is contained on two circuit boards arranged in the bottom part of the machine, stacked one atop another, with a metal frame that separates and provides mounting points for the boards. The main (bottom) board containes 38 IC's and only 12 transistors, along with a substantial compliment of capacitors, resitors and diodes. However, the discrete component count is quite reduced from the Compet 22 and earlier bipolar IC-based Compet 31/32 calculators. This board has two edge connectors at one end. One connector provides connections for the display subsystem, and the other connector provides power and signals from the keyboard assembly. The top board connects to the frame with four snap-type plastic fasteners that allow easy removal of the board. 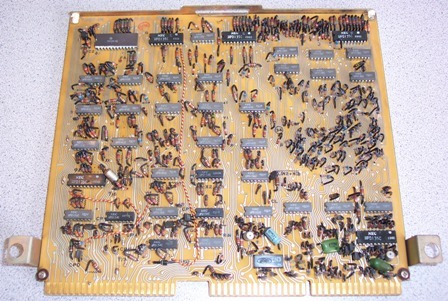 This board contains the Nixie tubes, and transistorized Nixie tube drive circuitry, along with other circuitry related to generating the display. A larger-scale Hitachi HD-3101 IC serves as a 16-bit shift register related to scanning the display. The display is multiplexed, meaning that each digit is lit only for a short period of time, with the refresh rate happening fast enough that the display appears constant to the human eye. This technique reduces the component count for driving the display dramatically. The display board contains 15 integrated circuits, and 44 transistors, most of which are used in the high-voltage drive circuitry for the Nixie tubes. The display board has a wire harness with an edge connector at one end that plugs into an edge connector on the main board. Interestingly, it appears that the manufacture of the circuit boards in this machine were a joint venture between Hayakawa Electric Co. (the original name for Sharp Corp.) and Nippon Electric Co. (the former name for NEC). The circuit boards, which are made of phenolic, have both H.E.C. (Hayakawa Electric Co.) and NEC nomenclature etched on the boards. It is clear that Sharp Corp. made a strategic arrangement with NEC sometime in the late 1960's to be a major consumer of NEC's early MOS IC's, and perhaps the partnership spread to the point where NEC was a major subassembly contractor for Sharp. Sharp engineers would design the circuity, and NEC would design and manufacture the circuit boards. This isn't historically verified, but appears to be the likely scenario. The circuit boards have traces on both sides of the board, with feed-through holes providing connections between the sides of the board. A few jumper wires on the component side of the boards provide for connections which couldn't be routed by circuit board traces. The base of the machine, made of moulded ABS plastic, contains the power supply and logic boards. The power supply is a modular affair, contained within a metal enclosure to minimize radiation of electromagnetic energy. By the early '70s, American government regulations had begun to limit the radiated energy from electronic equipment, which probably is what prompted this power supply design. The power supply is situated across the rear section of the machine. 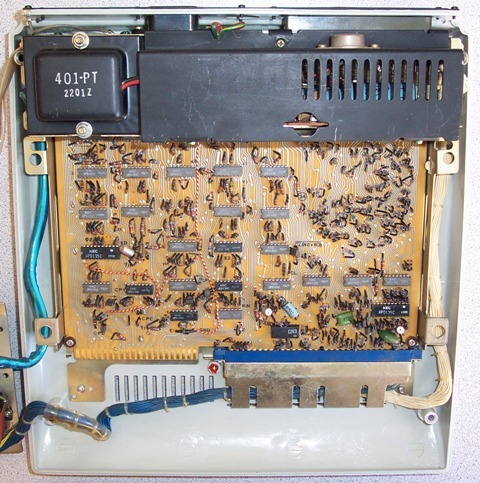 Integrated within the power supply assembly is a special connector which is covered by a panel on the rear of the machine that provides connections to the keyboard. This is for an external programmer option which can be attached to the calculator that allows learn-mode programming to occur. The programmer device would be similar to that available for the Compet 22. The power supply is a traditional design, with a compact transformer, diode rectification, and computer-grade filtering capacitors, followed up by zener-diode/pass transistor regulation for the logic supplies. A metal framework provides mounting for the power supply, along with supporting structure for the circuit boards. 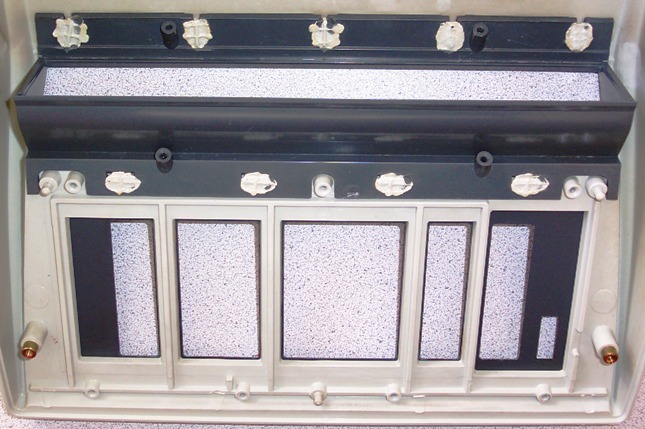 The upper part of the cabinet, also made of sturdy ABS plastic, is constructed of a number of assemblies which are cemented or heat-welded together. It is clear that the upper chassis is designed to be used in multiple applications. 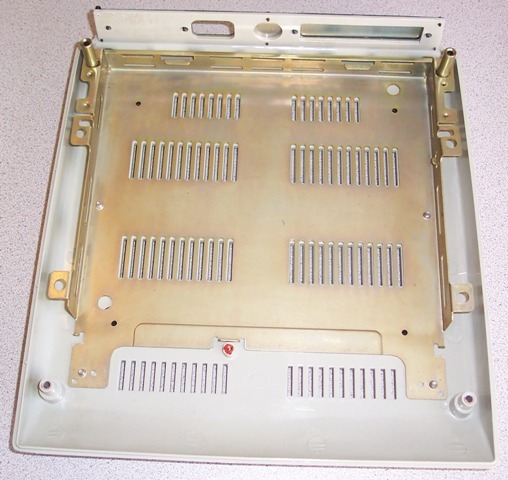 A blank area in the plastic casting that makes up the keyboard panel exists for addition of four more memory control keys, likely used for other models of Sharp calculators with similar form-factor and design. It appears that the same cabinet assembly is used for the Compet 261 (the sixteen digit version of the 241). The Compet 241 operates at a typical rate for MOS-based calculators. MOS circuitry of the time required slower clock rates than earlier bipolar IC's, so while MOS IC's allowed higher levels of integration, and lower-power operation than bipolar devices, calculators based on MOS IC technology always ran a bit slower than their earlier bipolar predecessors. The benchmark 9999999 X 9999999 results in the correct answer in about 3/4ths of a second. The division benchmark of 9999999999999 ÷ 1 (note thirteen, not fourteen 9's) takes approximately one second. During calculation, the display is not blanked, resulting in wonderful patterns of flickering digits on more complex calculations.